Chemistry is the study of the properties and interaction of matter at the atomic level. 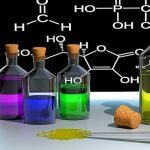 This online Chemistry course will cover Properties of Matter, The Periodic Table, Chemical Bonding, Nomenclature, The Mole, Chemical Equations, Stoichiometry, Gas Laws, Phase Changes, Acids and Bases, and pH. Labs during the course will focus on making observations, collecting data, drawing conclusions and writing lab reports. An emphasis will be placed on students understanding scientific inquiry, the scientific method, and the resulting science lab reports. More information can be obtained by contacting the instructor/author. Please note: Kit is configurable, please feel free to leave out items you already own or can acquire cheaper locally.